This entry was posted on March 18, 2008 at 7:17 pm and is filed under Omoge with tags I don tire for Naija babes Part 2. You can follow any responses to this entry through the RSS 2.0 feed. You can leave a response, or trackback from your own site. You dey laugh!, no worry u’ll find out real soon. Quoting the great False Prophet (Obe Jay), the prime candidate for a (lifetime) companion should be some-1 2 whom U can tell ANYTHING & who the only reason U wouldn’t tell certain things would be out of respect (i.e. it SOUNDS a little rude) NOT because there exists trepidation that she/he will be offended, or she/he will not understand, or she/he will “act out”, or she/he will question U’r motives or integrity or sanity. This may be a good add-on 2 Naijaman’s 2008 advice 2 “keep it real”. I won’t go as far as saying the behavior is not sustainable – we all probably have parents & grandparents who as far as we were permitted 2 know, proved it is – I will say that if the basis 4 displaying such behavior is pretext (just 2 get in good), then 1 has just set themselves up 4 failure & will likely end up blaming “why tings dey scatter-scatter” on the recipient of the behavior as opposed to themselves i.e. the “greatest lie” alluded 2 by the False Prophet of Awon Boyz court (where we shall speak English 4 the benefit of all foreigners). If he is good enuf 2 buy shares in Vikkie’s secret 4/ red light special the VIP room with/ take on his last name (& that’s becoming a thing of the past now thanks 2 some punk-**s men) how come he isn’t good enuf 2 answer 2? Or as the erudite False Prophet would politely surmise, is this an ongoing example of the estrogene derived concept of having 1’s cake & eating it 2 a.k.a. a girly-man/woman’s right 2 chose? “but U’ve not been identified as my CO & U’re not following proper comms protocols!”. Her point was, if there’s an AGREED chain of command & assigned duties/expectations of each member of that organization, then for unit cohesion & mission accomplishment field manuals & disciplinary articles (the ridiculous GNW?) should be adhered 2 or the contract/ oath should not have been applied in the 1st place. She was absolutely right but she probably should’ve secured a contract 1st …….or gotten a battle-field promotion. Excuse me while I consult the JAG office for a disclaimer to the above. Looollll! this is interesting I am all for a man communicating with me on every level. I was brought up by a Calabar grandmother who made sure my behind was in the kitchen at age 3, by so doing I learnt all the tools of the trade including the overall welfare of a man and my place as a woman. I have no problems with doing my part as long as the man will do his part to and that includes, regular battle field promotions, a chanel bag once in a while and trips to the french riviera. Maybe eventually giving me hislast name. What I guarantee is heaven on earth for my king. Well put Charlie Sensi! (BTW, you have developed quite a fan base here over the past few days). However, regarding the sustainability of the said behavior, lets take it back to our grandparents like you suggested and hold it there for a minute. My grandfather had 13 wives and another 5 or 6 concubines. I know times were different then but that’s the very point I’m trying to make. In addition, there was a widely accepted “field manual” as you put it which made that the norm. Today, men like you and I will be dismembered and/or eaten alive in the ensuing mutiny if we were even foolish enough to openly suggest a replay of history. These days polygamy puts on a modern, covert face as seen in ex-wives, baby mamas, mistresses, side chics, jump offs and other eco-friendly arrangements. (Oh, and lest we forget all that goes on in the Oval and VIP rooms). Naijaman , let me find out you have any eco-friendly arrangements. I go even participate in the beat-down. Your grandfather’s days are done and over with, we don go school now, naija babes don ‘damo’..
Calabar girl, u wan tell me say you no dey recycle?? LOL! Charlie, while we are on the topic of recycling, I think it’s time to dust off the lost chronicles of Okafor and present “The Law”. Roger that Naijaman 1! I read U Lima-Charlie (loud & clear), break. Request close-air support/ fire-support at the following grid, break. “Kilo echo echo papa india november golf” break. How copy last traffic, over? Good copy Naijaman 1, break. target acquired, I say again, target acquired! Now if men in general (in unison?) took this approach 2 any “mutiny”, there likely would be a FEW (?) less cases of misinterpretation of the rules of engagement. That said, recognizing the changing face of the battle-space requires MORE OF winning of hearts & minds & a LITTLE LESS “shock & awe”. 1 side of the equation should always remember to speak kindly & walk with a big stick, the other side should remember not 2 bring a knife 2 a gun fight. As per Baba ’70’s prophetic stipulations since we are speaking english in this court for the benefit of all foreigners, “The Law” & it’s corollaries. Yes please. Typical men, I just asked what we were recycling and una don carry me go Iraq come back! Lol! 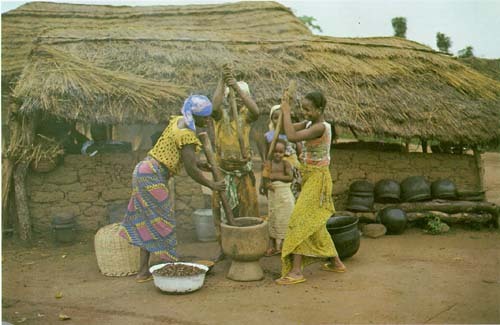 Why must we be pounding food with this archaic mortar and pestle Lanre, u don see us finish lol! Lol… it’s called team work. The trip 2 Iraq was by kind courtesy of Post Traumatic Stress Disorder. The recycling U were asked if U UNDER-took, is by lascivious courtesy of “keri-keri Konangona” & “obukoko” (under STP) ……as will no doubt be elaborated on when either the chronicles of Okafor or, “The Law” & it’s corollaries are expatiated on. Thanx 4 U’r patience & understanding. p.s. Teamwork? I thought it was called menage-a-something-else-or-the-other. Hmmm… U are right, it does sound like something that should be expressed in French! I am a new naija wife. I came to Nigeria for the first time in May and got married there in June. No one could of prepared me for Nigeria. No matter how much my husband told me it was beyond what I knew. Nothing was as I know what i am used to. Everything so different. I sure have so much respect for the women of Nigeria. I don’t think I could live there more then a couple of months. You got 15 people living in one house and only one girl doing all the house work, cooking, cleaning and everything. The women work, and do all of the house work and up bringing of the kids?!! It nuts! Sorry, but the husband only goes to work? But the wife going to work plus all of of the above. Like why the husbands not help out? The husbands have the easy part. I am glad mine not like that, but then he would not have a choice. I am glad my husband more open minded and knows more of the western world. Although I think he will be quite shocked when he comes to my country. I could not even cook when I was there. I tried, but nothing I was used to I tried washing clothes by hand, ha too funny. I was better at getting water. It was like camping. No electricity except generator sometimes, no running water, no washers and dryers, ovens, microwaves and people constantly coming to the house day and night. It sure takes some getting used to. I can’t wait to go back, nicest people I ever met and part of me loved it there and part of me is glad to be home. Yet, I can’t wait to go back. I miss my husband and family there. The worst part was the traffic and the police demanding 20,000 Naira and trying to take you down to police station if you don’t pay yet they try to act like they your best friend. As if we got that kind of money. At the same time I never felt more comfortable around anyone before then the people of Nigeria. Clearly, Naijamama knows Naijaman! I’m in Ilesha man! p.s. Wiki “Satire” when you have a minute luv! I obviously know a lot about you from this display of insanity…u remind me of that mad man down the street by Alade market… How dare you speak of Wiki when you know nothing about Enlightenment….speaking of the things a woman should…portraying her as a slave to a Master, you obviously have no regards for your MAMA, cause if you did, you would treat or perceive women with a little more respect than you do…. As a matter of fact, hun, you sound like someone who needs immediate therapy…not to be offensive…NO! Nothing like that at all. You simply have been hurt before and decided to take it out on the world…Right??? Ok!!!! it’s reality….Always remember; Life’s a Biatcch…Wake up to the real world…Deal with your situation like a man and stop Bitching…leave that to Ladies….But then again your welcome to our world; you won’t be the first. So ri nkan ti mo m’an so!?! If dem carri dis sisi dem go place in conversation wey dem no like or dem no get proper answer for, na to da gbogbo E si rough na im remain! What “laughs” me is that when 1 indulges in (written) finger-pointing (a.k.a. lashing out? ), it doesn’t seem evident to them that they are giving evidence of their own enlightenment & therapy requirement(s). Walahi my brutha, U’re a better MAN than I.